On Alaska's Mount Gannett, pleasant weather can turn nasty quickly. Sunshine gives way to frigid rain; clear skies fall victim to thick storm clouds and fog. Not ideal conditions for exploring a 63-year-old plane wreck on an isolated, crevasse-riddled glacier. 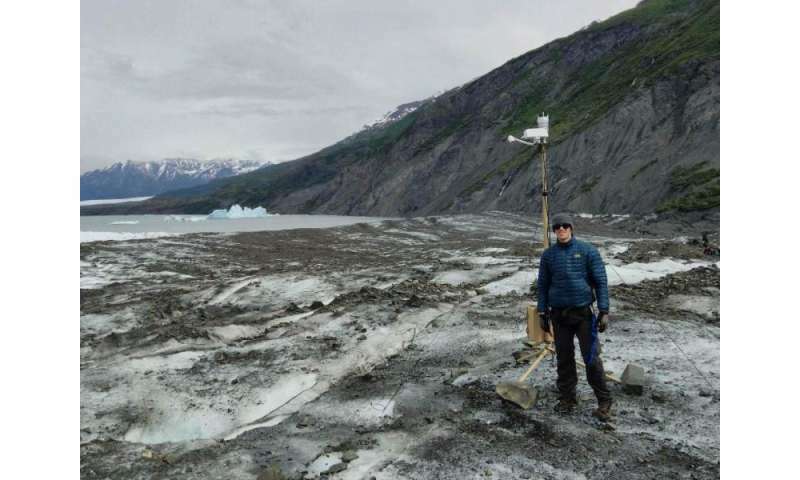 Last month, the Scripps Institution of Oceanography, U.S. Air Force, Alaska Army National Guard and Defense POW/MIA Accounting Agency used a portable weather station (the Expeditionary Meteorology System, or XMET), developed with support from the Office of Naval Research (ONR), to monitor conditions at a 1952 crash site of a military transport aircraft. "The XMET has been tremendously valuable," said Terri Paluszkiewicz, a program manager in ONR's Ocean Battlespace Sensing Department. "We continue to find uses for it in expeditionary situations like the recovery operations in Alaska." Transported in a hard-shell case, the XMET is mounted on a tripod and can be assembled in five minutes by two people with no tools. The solar battery-powered system uses sensors to compile real-time measurements of rain, wind, temperature and visibility—relaying hourly weather information via satellite to planners who can use the data to cancel or proceed with a mission. Previously, such detailed information could only come from observers on the ground. "The XMET was extremely useful in the crash site's environment," said Scott Katz, a special projects officer at Scripps. "The surface of the glacier can only be accessed by helicopter. The XMET provided valuable meteorological measurements to let recovery crews know if it was safe to fly each day, allowing them to make informed predictions and keep everyone out of harm's way." The XMET resulted from a 2008 conversation between a Marine and Scripps researchers about the need for better weather-forecasting technology because of the dangers of flying in extreme desert conditions. The researchers reached out to ONR for support and, within a year, the XMET emerged and was soon being used by warfighters in Iraq and Afghanistan. This year's recovery efforts in Alaska, which wrapped up this month, marked the first time the XMET was used at the Colony Glacier site. Six decades ago, an Air Force C-124 Globemaster II crashed into Mount Gannett in the jagged Chugach Mountains—known as Alaska's "graveyard of airplanes." A search party was dispatched, but harsh weather turned them back, entombing the wreckage in snow and ice. In 2012, a plane spotted yellow debris on the slowly melting glacier, situated at the base of Mount Gannett. The Alaska Army National Guard investigated and identified the C-124. Since then, month-long recovery efforts have been held each summer to retrieve debris and identify remains of the 52 crew members and passengers. So far, 17 people have been identified and returned to their families for burial. There is a race against the clock to recover as many remains as possible before the wreck site breaks off Colony Glacier and sinks into a nearby lake. In addition to the Alaska recovery efforts, XMET technology is being used in places like the Republic of Palau to monitor weather conditions at World War II aircraft crash sites, and in the Philippines to help forecast typhoons and other storms. The XMET aligns with several tenets of the Cooperative Strategy for 21st Century Seapower, a maritime strategy shared by the U.S. Navy, Marine Corps and Coast Guard. The strategy calls for increased focus on battlespace awareness, which includes surveillance, intelligence gathering and greater knowledge about the environments in which warfighters operate.